The Phillies entered the end of the first of the three legs of their current road trip with the following difficult task: attempting to split a four-game series with the scorching Arizona Diamondbacks (15-6 in June) with one of baseball's best pitchers (Zack Greinke) on the mound. But, hey, enough about another sleepy summer weekend when a lot of people probably largely ignored the latest chapter of bad Phillies baseball. Some fun stuff has happened for Phillies fans in the last five days, most notably the promotions of two of the team's top minor league hitters to Triple-A. Yes, in case you missed it, second baseman Scott Kingery, No.3 on our latest Phillies Prospect Power Rankings, and outfielder Andrew Pullin, No.9 on that same list, are both in the IronPigs lineup tonight. But enough about the IronPigs. Wait, not really. Many of your #PhilsQuestions involved the Pigs, naturally. This is what happens when the major league team owns baseball's worst record. When the Phillies placed right-hander Jerad Eickhoff on the disabled list last week, they had a few days to decide on three options. They ended up choosing the path of least resistance by calling on Mark Leiter Jr. to take on the job as a spot starter (which he did very well with on Friday, and which he’ll get another opportunity to do on Wednesday in Seattle). Leiter already had major league experience and was still on the team’s 40-man roster. The 40-man roster decisions that are looming after this season make it far from a lock that Tom Eshelman, despite dominating minor league opponents at two levels for most of the year, will make his major league debut in 2017. The Phillies had to add a whopping 11 prospects to their 40-man roster last November in order to protect them from the Rule 5 Draft. A good chunk of those 11 will likely remain on the 40-man going into 2018, too, along with the players who were already on the roster (young big leaguers like Aaron Nola, Jerad Eickhoff, Vince Velasquez, Maikel Franco, Odubel Herrera Tommy Joseph, etc.). 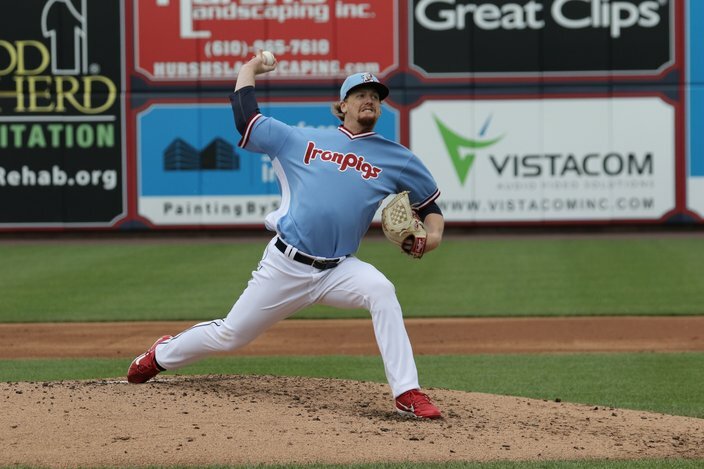 Tom Eshelman has an International League-best 2.08 ERA and 0.94 WHIP in nine starts with Triple-A Lehigh Valley. And then the Phils will also have to protect a whole new group of prospects from this winter’s Rule 5 Draft, a group that includes J.P. Crawford, Rhys Hoskins, and rising left-handed reliever Austin Davis, among others. And they may protect guys they didn’t protect last winter, who would again be Rule 5 eligible, like Andrew Pullin, Seranthony Dominguez, and Carlos Tocci, among others. I won’t rule out Eshelman making his major league debut at some point. As we’ve already seen, pitchers are vulnerable to injury and we’re not even halfway through the season. Still, because of the aforementioned 40-man roster ramifications, I think Mark Appel may get an opportunity before Eshelman this summer. Funny question, because I asked this to Kingery himself about a month ago. He told me he’d never, ever played third base. This isn’t to say he couldn’t, though, if asked. Kingery is known for his defense as much as he is for his offense. It’s why the Phils’ brass has talked about experimenting with him at other spots in order to increase roster flexibility moving forward. (Before you bash current [injured] second baseman Cesar Hernandez, which doesn’t even make sense given Hernandez’s offensive contributions over the last year, wouldn’t it make sense to try to get both on the field, rather than get rid of one?). But I digress. Kingery probably could play third base. And he could surely play one of the outfield positions. What about shortstop? If 2017 is a fact-finding mission in the big leagues (seeing who can do enough to stay in 2018 and beyond, and who will go at season’s end) the same philosophy should be at play in the minor leagues, seeing who can do what now to better inform your decisions later. Also, for reasons similar to the ones in the previous question, Kingery might not make it to Philadelphia this summer. As a college player selected in the 2015 draft, he won’t be Rule 5 eligible this winter, and thus, isn’t a lock to be placed on the 40-man in November. The Phillies are playing their 75th game of the season on Monday afternoon in Phoenix. So, when I do the math, that means this season isn’t even halfway over. Scary, huh? Because of that, I have no business projecting a 2018 starting rotation. We still have a lot to learn. I will say that Aaron Nola and Jerad Eickhoff (even if the latter is having a down year) are as close to locks as you have on the current roster. We still have to learn a lot more about the Nick Pivettas and Ben Livelys and Zach Eflins of the world. Ditto Vince Velasquez, who will have at least the second half of 2017 to prove he has the stuff to be a dependable starter before making a possible transition to backend bullpen arm. And it wouldn't be surprising to see the Phillies make a trade or sign a free agent starter to a multi-year deal this summer. Lots of questions concerning the coaching staff. And I get it. The Phillies (24-50) enter play Monday on pace to lose 109 games in 2017, which would be tied for the second most losses in the 135-year history of the franchise. If this happens, yes, some heads will roll, whether it’s their fault or not. And, if you manage to lose more than 100 games, there is surely a lot of blame to go around, so I’m not saying it is or is not anyone’s fault. With that said, and while agreeing with the premise of the question that, yes, members of the coaching staff (and perhaps even the manager) will be “sacrificed if they don’t improve by year’s end,” consider the following example. The opposing team brings in an erratic reliever who walks Phillies Hitter X on five pitches. Hitter Y follows and takes a bad swing at a slider low and away on the first pitch of the very next at-bat. Yes, at some point, the blame will fall on the manager and coaching staff. But, when these players get on the mound or in the batter’s box, they have to perform. And if they do not, it’s the people above the pay grade of the coaching staff (ownership and the front office) responsible for deciding to replace said players from the roster. Possible? Surely. If Adeiny Hechavarria is an attractive trade chip to a team looking to improve or a contender filled with bats every else but shortstop, defensive wiz Freddy Galvis could be that guy, too. (Assuming that J.P. Crawford will emerge from his dreadful first three months of 2017 and be back in the good graces within a year). There aren’t any untouchables on the Phillies roster and very few in the organization as a whole, really (Sixto Sanchez, maybe?). So any one of their infielders could be replaced within a year. Even Maikel Franco, although ate age 24 with four years of club control remaining, the Phillies can be a bit more patient here. A year for now, though? Yes, Franco, too, could surely be replaced if he hasn’t displayed any growth by then. I’m putting these two questions together. Yes, I think there will be relief coming from Allentown. Although general manager Matt Klentak obviously hasn’t excited the fan base by making room on the 40-man for guys like Mark Leiter Jr., Casey Fien, Cameron Perkins, and Hoby Milner, he has at the very least shown he’ll call on the farm and open spots on the roster when he deems it the right time for all parties. And this is the tricky part, knowing when the time is right, now only because there is a need at the major league level but in also determining it’s in the next interest of the prospect. As a front office man, you have to know the mentality of your top prospects and weigh in the risk of calling them up only to quite possibly be forced to send them back down if they struggle, and how the latter could affect their overall development negatively. Now, you can certainly make the point that anyone that could be mentally crushed, at best, or ruined, at worst, from such a scenario isn’t fit to be a difference-making big leaguer. Still, the feeling here is Klentak will slowly add the prospects many have been eager to see in a Phillies uniform as the summer continues (again, the MLB season isn’t yet halfway over). Perhaps one of the outfielders (Dylan Cozens or Nick Williams) arrives when Howie Kendrick moves before next month’s trade deadline. Ditto rising relief prospect Jesen Therrien when Pat Neshek is traded. So Scott Kingery, Andrew Pullin, Rhys Hoskins and Nick Williams will play together in AAA. Combined they have 65 HRs in about a half-season. In August, maybe another opportunity arises because of ineffectiveness or injury on the big league roster and because, at the same time, a budding prospect has shown real growth through the summer or through the past two seasons (Andrew Pullin, Rhys Hoskins?). So, yes, I do see “help” coming, although I might use that word since no prospect is guaranteed to be a savior or an upgrade immediately. (The major leagues are tough, as Cameron Perkins might be able to tell you). And, no, I don’t think Klentak is worried about the IronPigs’ postseason run; the roster won’t be raided completely. There will be plenty of talent left in Allentown come September (and the Phils could add September call-ups after the Pigs’ season ends, too). This is a funny, entertaining account worth following, particularly during a summer when Phillies fans need something that is a bit less depressing on a daily basis. As for those 2008 Phillies (who would go 13-3 in their last 16 games before the postseason got underway), I think they’ll be fine.